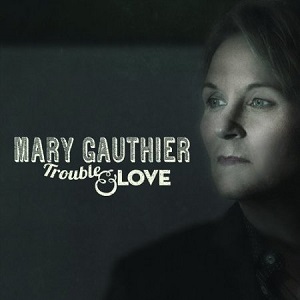 Mary Gauthier has released six studio albums since 1997 and these have won her various awards and lots of praise including priase from Tom Waits and Bob Dylan. She's also written songs that have been recorded by artists including Candi Staton, Jimmy Buffett, Tim McGraw and Boy George. Now she's releasing her new album, "Trouble and love", her first album for four years. She's chosen to do this independantly of the major record labels to give herself more control. Her music has been described as Folk, Country, Alt-country and Americana, but however you choose to describe it, one thing is not in question and that's the quality of the music - you're sure to get a top quality album, and that's definitely the case here. The album opens with "When a woman goes cold". The slow pace and soulful vocals are typical of the album, but it's the lyrics which really stand out to me here. The lyrics talk about a relationship slowly ending as the woman's feelings go cold. It's quite depressing but at the same time extremely listenable. Title track "Trouble and love" is another bleak and dark song, and the vocals carry so much emotion that you can't not focus your attention on them and the lyrics. "How you learn to live alone" is a song that will be familiar to viewers of the TV show Nashville, as the song was included in season 2 of the show. It was co-written with Gretchen Peters, and features guitar work from Duane Eddy. It's a great track, and the guitar work from Duane Eddy is used very subtly so that it adds to the song without being the focus of attention. This isn't an album of happy cheerful songs - more the opposite, these are quite stark bleak songs at times, with the vocals packed full of emotion and some beautiful music to accompany the vocals. It's a superb album that is highly recommended.